This page is for all Martial Artists to advertise their clubs, products or seminars (or anything relating to Kidan)...for free! Fill in the form on the "Advertise with Kidan" page. Sessen Ryu Karate Academy is based in Essex, England. With over 25 years experience and training direct from Okinawa it might be difficult to find a better place to train! The Kaizen Martial Arts Academy is based in Leeds, England. 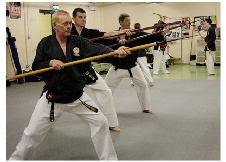 Please check out Jim Reece on his fact filled website on Shotokan and Kobudo!. Great stuff! Sasen Ryu Karate Academy is based in The Alicante region of Spain. This academy is becoming well known for its unique way of teaching youngsters. Check out the childrens, cadet,adult and family classes on their website. Talk Radio Europe is one of the biggest English radio stations based in Spain. It has fantastic chat and music! Why not tune in to Hannah Murray. More than Mushrooms is a fantastic new on line magazine for vegetarians and for those who want some advise and or great tips on becoming and staying a vegetarian. Kidans friends are welcome to advertise here free for 3 months. After the 3 month period is over you can re submit up to date info and be put straight back on! This gives every one a chance to be placed and for you to keep your info fresh!. Send us your name, club logo, business details etc along with your email and website. When the administration have authorised your material they will automatically be put on this page. All material submitted will be checked for content before inclusion.